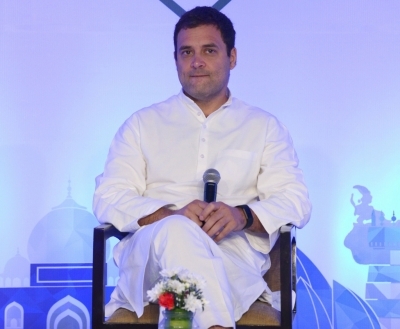 New Delhi Sep 14 (IANS) As Congress President Rahul Gandhi demanded Finance Minister Arun Jaitley s resignation over "free passage" given to the fugitive businessman Vijay Mallya activist Shehzad Poonawalla on Thursday claimed "Gandhi met PNB fraud accused Nirav Modi at a hotel here in September 2013." Poonawalla also challenged Gandhi to deny that he met Nirav Modi in 2013. In a series of tweets Poonawala said: "If P.L. Punia is proof of Arun Jaitley meeting Vijay Mallya (and accosting = meeting) I can swear on Quran and undertake lie detector @RahulGandhi attended Nirav Modi cocktail party and Bridal wear prog at Imperial Hotel Delhi in September 2013 while loans were wrongly given to Mama Bhanja". "Open challenge to Rahul Gandhi to deny he met Nirav Modi in September 2013 cocktail party -11th Sep if my memory serves me right! Imperial Hotel- Rahul spent a long time!Same period when loans given to Mehul Choksi & Nirav Modi!! SPG may have records or let s undergo lie detector test?" he added. Poonawalla also said: "There is a reason why Rahul Gandhi has formed a MahaGathBandhan with Vijay Mallya & relies on such fugitives statements - ever since the @narendramodi govt brought in the Fugitive Economic Offender s Law - Bhagodas and potential bhagodas are feeling anxious." The ruling party rejected the demand for Jailtley s resignation and instead sought to turn the tables on Congress by asking Rahul Gandhi to quit in the National Herald case.